You are here: Home » MEDIA » Cons » EGX Rezzed 2017: a PC gaming con report. 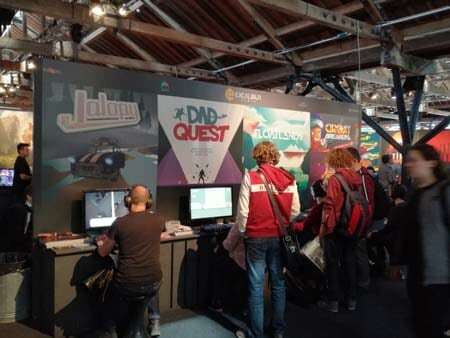 This is the first time I’ve been to one of the EGX cons, more specifically EGX Rezzed 2017 – an event for fans and semi-pro/pro game developers entirely dedicated to PC and console games – and I wasn’t disappointed. Not least because I could attend the con in my Joe Punter hat, rather than my rather tatty sing-for-your-supper-you-filthy-word-monkey guest speaker hat of many a science fiction/fantasy con. 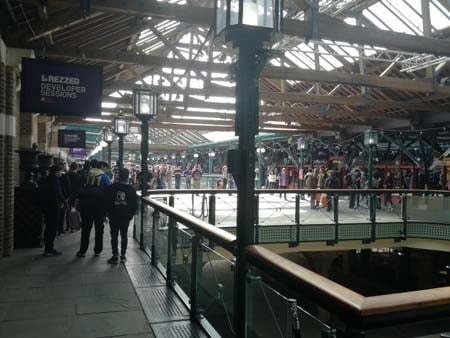 Rezzed is being held at Tobacco Dock near Wapping this year – half way between Canada Water and Canary Wharf, if you’ve ever worked in the London Docklands region of the big smoke. The event methodology seems to be to provide many hundreds of screens featuring hot upcoming PC/console games weeks before they’re publicly released, as well as various presentations streams by game designers for developers and would-be developers. Not tobacco today, just gamers. 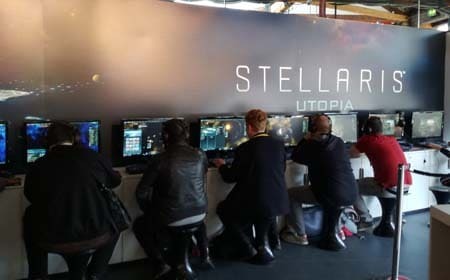 For starters, I dropped around to the Paradox Interactive stand close to the entrance to have harsh words about their Stellaris science fiction strategy game. How, I asked, are SFF authors meant to churn out a regular schedule of novels when there are distractions such as Stellaris in the universe? Well, the %^&$%^ers don’t care. Paradox even had a rather interesting new WWII war strategy game there called Steel Division (Normandy 44), which they are obviously planning to deploy to stop all activity at Chez Hunt save toilet trips and the occasional cross word with the wife & kids concerning familial neglect. 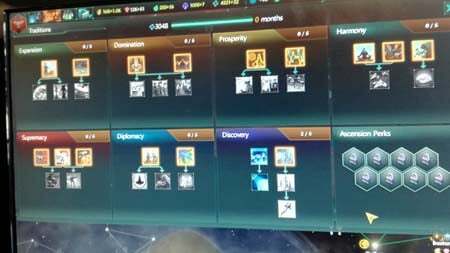 On that subject, how about Steam Workshop remove the obvious display of ‘Hours Played’ from their control panel (or “Hours to Divorce”, as my wife now likes to refer to it)? Let’s hide that stat away. Make it triple layer password protected, or something. 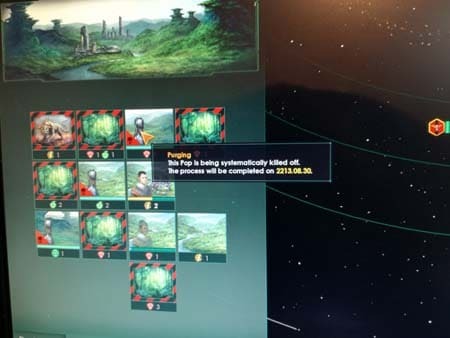 Took over this world, aliens started getting auto-purged! 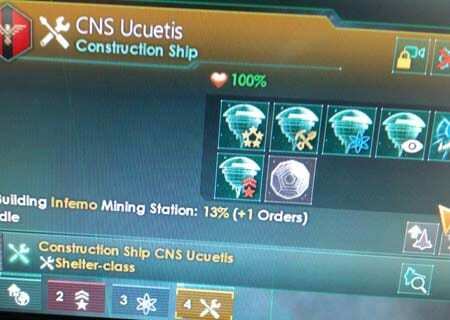 Construction ships that build Dyson Spheres! Monuments that give you Unity points. Fellow scifi strategy addicts in the 7 step programme. 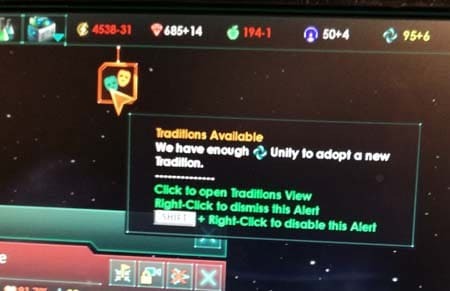 Blorg Scented Air Freshener? It smells like … victory. Now, I can’t say I’ve ever had many pretensions about aspiring to games programming – my coding skills are fairly limited. The nearest I ever got to landing anything games-related was when Games Workshop wanted to hire me to run their in-house print publishing arm (luckily for my future career prospects, that job fell through and I went off to work on what transpired to be one of the first print magazines to launch a web edition – nature.com). 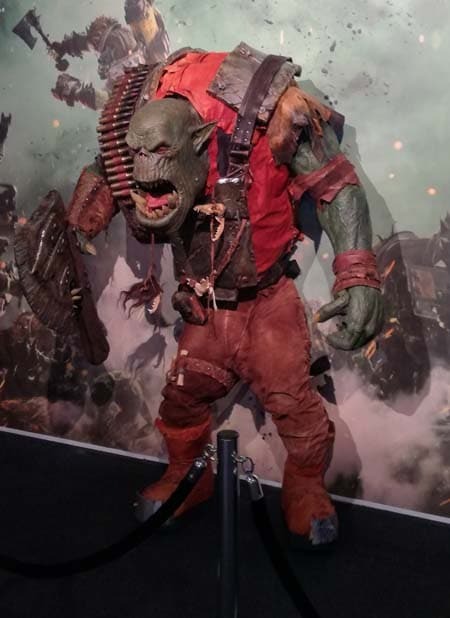 Reminiscing about Games Workshop, here’s an orc from www.dawnofwar.com – there were lots of eager players at the Warhammer screens. Too many for me to get my hands on the new game, sadly. Pity. It looked fun, at least from the shoulder surfing I managed to get in. While my C# may be lacking, I do so love a good strategy/RPG game as a player. Starting off with the early multi-player PBMs in high school interspersed with such ZX Specie classics as Lords of Midnight, Elite and Stonkers. And, ah, tabletop Traveller, D&D, Call of Cthulhu. Memories, memories. I’m not a great fan of 3D twitch-gaming. I remember myself and my friends being blown away by the first Wolfenstein 3D back in 1992. Now, the graphics have got way better, the maps super-sized, the flecks of blood flying from zombies almost cinematic in quality, but you’re still basically just running around blasting %$% (or driving over it, a la Grand Theft Auto). 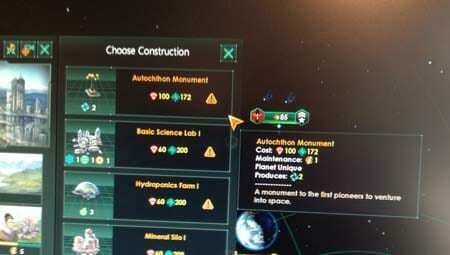 Give me a strategy game any day. I think we chucked over Wolfenstein for a space war game called Masters of Orion in 1993 in my house – and I have never looked back since. One interesting facet of the con is a fairly large careers fair staffed by a number of universities and colleges which offer degrees in game programming, animation and the like. One of the junior Hunts has expressed interest in following this noble trade, so I collected prospectuses for the nipper. I had a chat with the job fair staff and their lowdown was that where the real shortage of talent is today, is in the hard-core engineering/coding skill sets. As far as using the tools of game development go (composers/animators etc), that section of the market is pretty saturated, and your chance of getting a job in games development after graduation not so healthy, numbers wise. No surprise there. I did a year of study at Saint Martins and most the artists/illustrators/designers I know are delivering parcels or pushing pixels for local council admin departments, not living the dream in Soho studios. Indie games are big at Rezzed. The ideal course criteria for entry into a computer engineering degree are high grades in A-level Maths, Physics and Computer Science. Only 10% of secondary schools in the UK currently offer computer science, so universities don’t make this course a must-have. They do like you to have the new hard computer science A level with mandatory programming that has just been introduced, though, rather than the old joke qualification (“Here’s how you open a Word document”) which is being ditched – or should that be phased-out – by schools. Interestingly, the lecturers told me the maths you learn at secondary school aren’t much good for game programming, but it does at least demonstrate you’ll have half a chance at surviving the maths they will throw at you at university. Anyway, if you want a day of playing exciting upcoming PC games, as well as the chance to listen to developers and industry professionals give you advice on entering the games development field, then you won’t find much more fun than Rezzed. It’s on until Saturday 1st March 2017. Saturday is sold out, sadly. It’s that good! 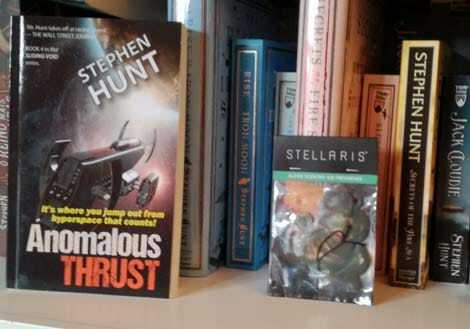 Stephen Hunt is the author of thirteen scifi & fantasy novels from publishers such as HarperCollins, Tor and Hachette. « The Blackcoat’s Daughter (2017) (a film review by Mark R. Leeper).